Singles fabric sample, originally uploaded by davidscf. Project planning for an upcoming project. This is a 2/1 twill sample from handspun singles. This entry was posted on Tuesday, January 21st, 2014 at 6:43 pm	and is filed under Uncategorized. You can follow any responses to this entry through the RSS 2.0 feed. You can leave a response, or trackback from your own site. Beautiful! I hope you made a scarf from your sample. 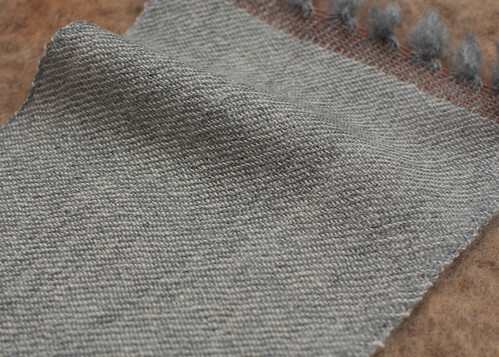 Sometimes the simple choices make for such an elegant fabric…I look forward to seeing your finished project.